Where has the time gone? Being a part of the Netball Superleague over the last 10 years has been such an amazing journey for me. When I think back to when I sent off my application to potentially be a part of the team called Celtic Dragons (which I had never heard of!) it does not seem that long ago, but by gee time has flown. I have had so many amazing opportunities to play with, and against, some of the world’s best netballers and I am writing now to say that this year will be the last. It is with heavy heart that I announce my retirement from the Celtic Dragons and the Superleague. 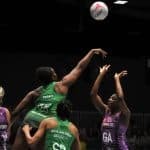 It is amazing to think that had I not started as an import player, I would have never come over, met my husband and stayed to play in this netball league! It has been a whirlwind of a journey and one I am very proud to say I have thoroughly enjoyed. 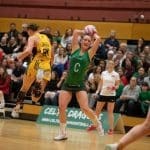 From the highs and lows of each season: injuries, selection, non-selection, meeting new people and making friends for life, it has been a pleasure to be a part of and I can’t thank Celtic Dragons enough for their continued support over the past 10 years, with one year spent over the bridge with Team Bath. I have had the opportunity to work with some amazing coaches, great support staff and supportive team members. Not only have they pushed me to my limits, but they’ve made me into the player I am today. They all know who they are – there are too many to be able to mention – but I cannot thank them enough for everything each one has done for, and given to me throughout my time playing. Everyone I have had the pleasure to work with has made a mark on my career. They have helped to support and guide me, kept me intact and pushed me to continue playing the sport I love for so many years. I have a piece of each of you with me. THANK YOU all. To my family both in the UK and back home THANK YOU. Without your continued support, your honesty, help and sacrifice for the game I love, I would not have been able to do all the amazing things I have done. Without you I would not be playing. To all those GREEN ARMY fans, the support you’ve shown not only me but also the Celtic Dragons over the years has been amazing. Your continued support has kept us going through our lows and highs and it has been a pleasure to have you alongside me for this amazing journey. To my sponsors Mizuno, Agile Therapy and Elite Fitness (Simon) I cannot thank you all enough for the guidance and support you have given me in the time we have worked together. It has been a pleasure to be a part of your organisations and I am grateful for the time you have invested in me. I have been toying with the idea for some time now and feel this is the right time to step away. My heart and mind would continue until I am old and grey, however my body says otherwise. It has been great to work alongside Tania and the new coaching staff this season and I wish them and the franchise all the very best in years to come. I may not be on that court next season however I will definitely be there screaming at you all from the sidelines. May this franchise continue to grow and flourish for future netballers in Wales and beyond. For now though, it is time to continue what I started and finish this season on a high. Alongside my teammates: the most competitive, caring and enthusiastic group of women, for the next 6 games we will really look to stamp our mark on this year’s Vitality Netball Superleague.